In-Home Care Alliance is devoted to providing the most professional, reliable, and friendly certified caregivers in the home care industry. Our in-home caregivers provide assistance with home care services such as errand services, transportation to doctors, medication reminders, housekeeping, laundry, grooming, dressing, bath safety monitoring, and more. All in-home care services and schedules are tailored to the needs of our in-home care client, and our certified caregivers are available for hourly, daily, weekly, overnight, 24-hour or live-in home care assignments. Our wonderful home care aides truly have a passion for providing quality home care – and they are OUR employees, thoroughly interviewed, screened and background-checked (state and national), trained and oriented, bonded and insured. We have rigorous hiring practices in which all applicants go through tests and screenings focusing on skills, experience, attitudes and placement into homes. Most importantly, each and every one of our certified caregivers must be dependable, warm and caring people. Many of staff members have extensive experience caring for Alzheimer’s and dementia patients. Our caregivers are the cream of the crop. They are totally committed, highly qualified and carefully selected individuals who are dependable and extraordinarily caring of others. In order to ensure this, we look for warm, honest, caring people and then we help them boost their skills to become the best the industry has to offer. Our caregivers have access to our exclusive Certified Companion Aide (CCA®) and Certified Hospice Companion Aide (CHCA®) caregiver training programs. So, in addition to their previous experience, our caregivers receive continuous training through this one-of-a-kind curriculum, guaranteeing that In-Home Care Alliance’s caregivers set the bar in providing the best home care in Arizona. No other in-home care agency in Arizona offers such comprehensive caregiver certification training programs. Clients can trust our CCA’s and CHCA’s to perform their duties with professionalism and dedication while they help clients maintain independence and treat them and their loved ones with the dignity and respect that they deserve. 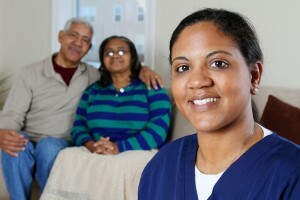 Does your loved one deserve superior home care? Contact us for your free no-obligation home care assessment today to discuss how In-Home Care Alliance can provide the best certified caregiver in Arizona for you or your ill or elderly family member. In-Home Care Alliance is Arizona’s best home care agency providing a wide range of in home care services in the Metro Phoenix, Scottsdale, Glendale, Paradise Valley, Arcadia, & Cave Creek Arizona areas. Need a Certified Caregiver? Request Your Free Home Care Assessment Today!